Osbaldeston Riding Centre has a long established reputation for the excellent services offered to the equine community and is a major competition centre at all levels in all disciplines. Osbaldeston Riding Centre has been owned and run by Norman and Molly Bargh and their daughter Janet since 1986. Over the past 30 years the team have built up a wealth of knowledge and experience with someone always on hand to offer help and advice. 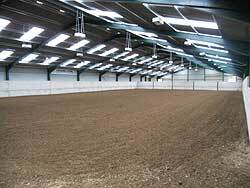 Ideal equine training facilities for individuals, groups and clubs. 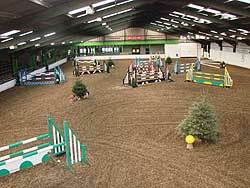 Large Arena 60m x 30m from £35 per hour Small Arena from £30 per hour. Large savings for friends/groups sharing hire. Only £5 per hour for additional users. Easily reached from Clitheroe, Blackburn, Preston and all surrounding districts. Facilities include 3 indoor schools, one outdoor arena, farm ride (for liveries only), stabling and full catering, bar and shower facilities on site.